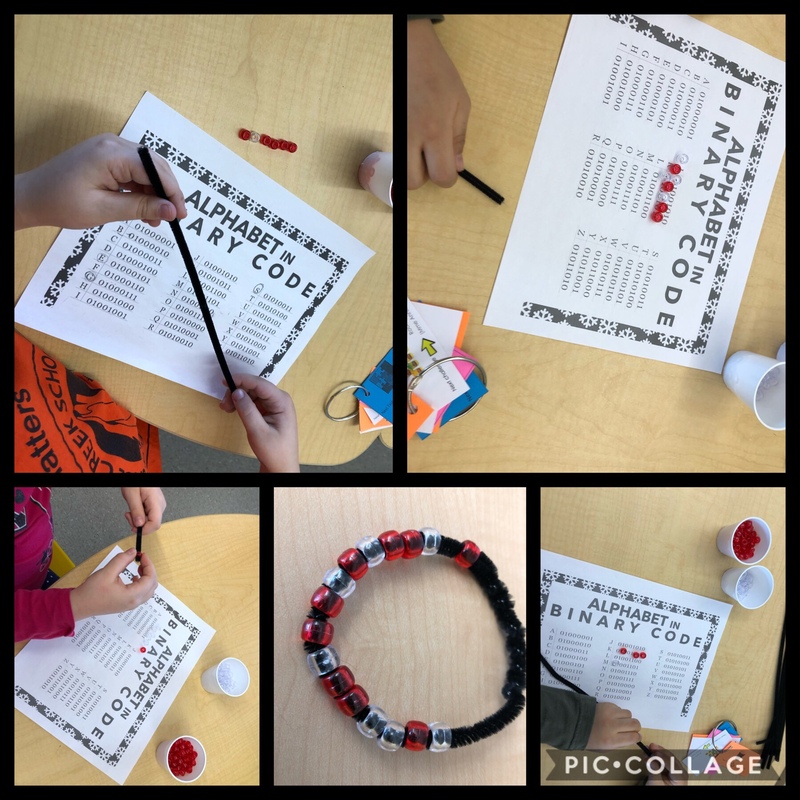 Not only is today Valentine’s Day, but it was also our 100th day of school! For those who don’t teach the little ones, believe me when I say that day 100 is a BIG deal and that it must be celebrated! 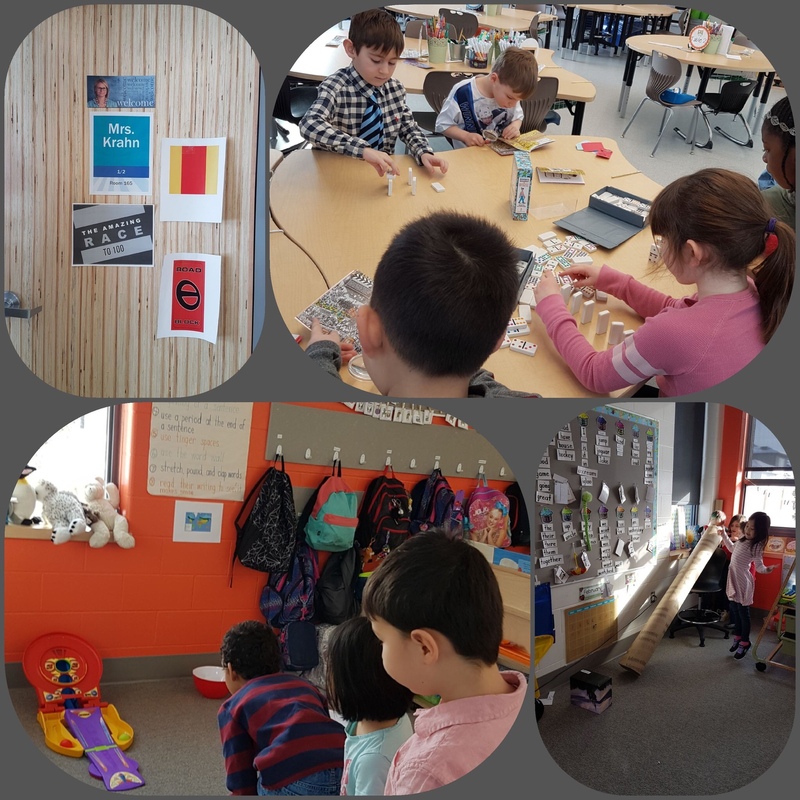 Naturally, 100 becomes the theme for the day, and curricular connections are made while having an absolute blast! 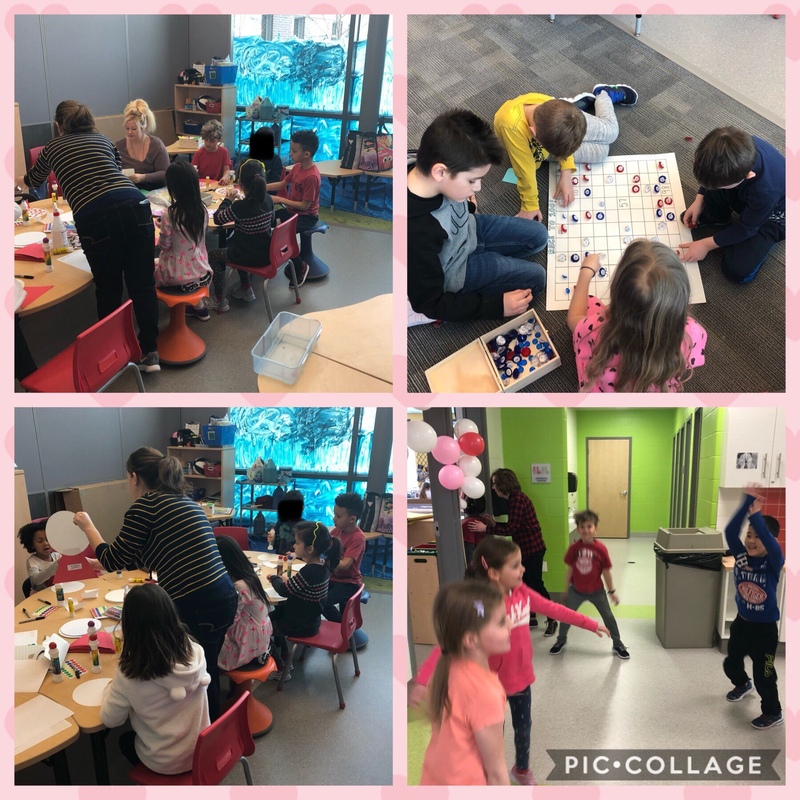 But today… today being the 100th day of school paired with Valentines Day and amazing colleagues’ ideas made this day my favourite day 100 to date! 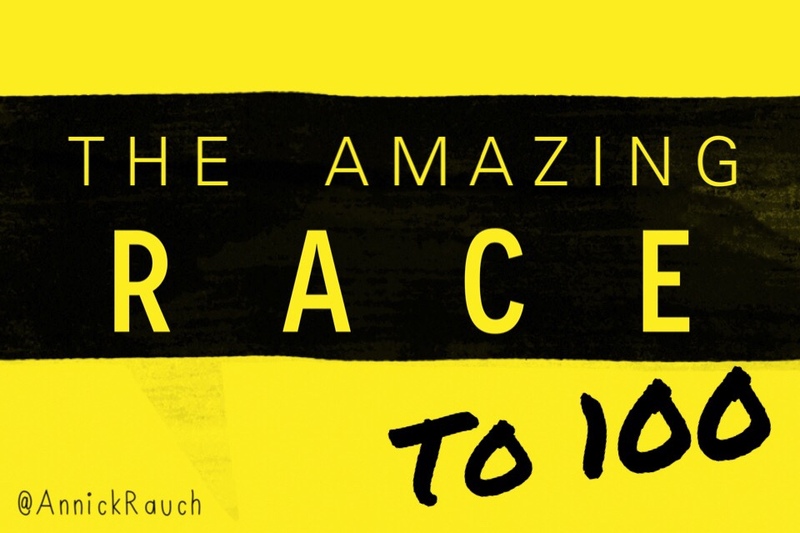 As our school grade 1 and 1/2 team met and discussed options for what we wanted to do to celebrate day 100 this year, Michelle Didyk and Stacey Grabowski brought an incredible idea to the table: “What if we did an Amazing Race to 100?”. From that point on, we were sold and just had to figure out logistics and how this would look for over 150 kids. 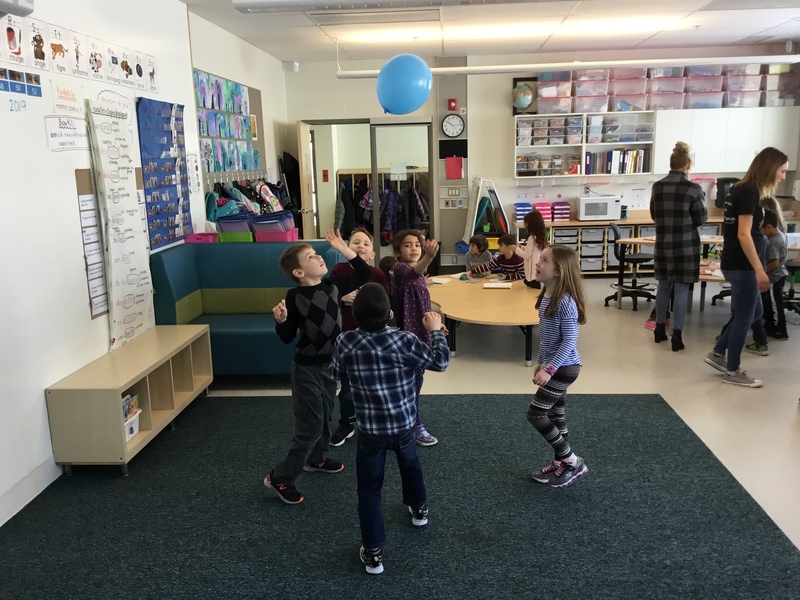 We loved the idea that students would be in groups and would advance at their own pace while they completed challenges… no room for waiting around, just constant fun and moving from task to task! 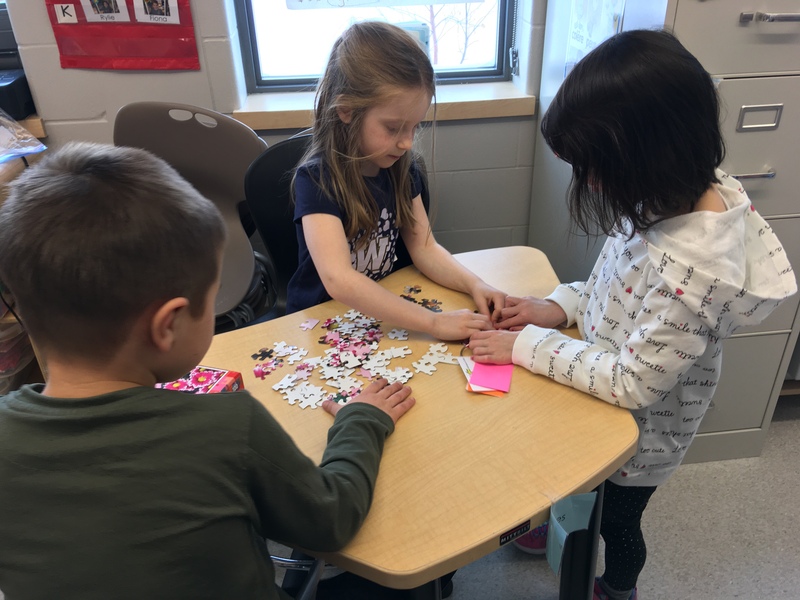 We decided that each teacher (that was 7 of us) would plan 2 challenges in our classrooms that would take no longer than 10 minutes for groups to complete. The challenges would be linked to 100, and each challenge would have room for 3 groups at a time (think: same challenge but 3 separate spots to complete it). This meant that the maximum amount of groups each teacher would have in their classroom at one time was 6 (3 groups at each challenge). 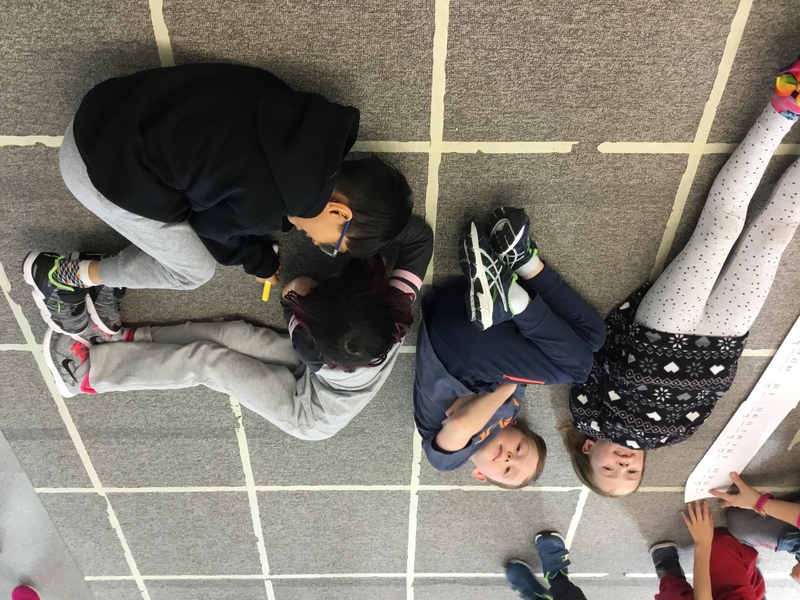 If a fourth group reached a challenge where there were already 3 groups, they would get a ROAD BLOCK! 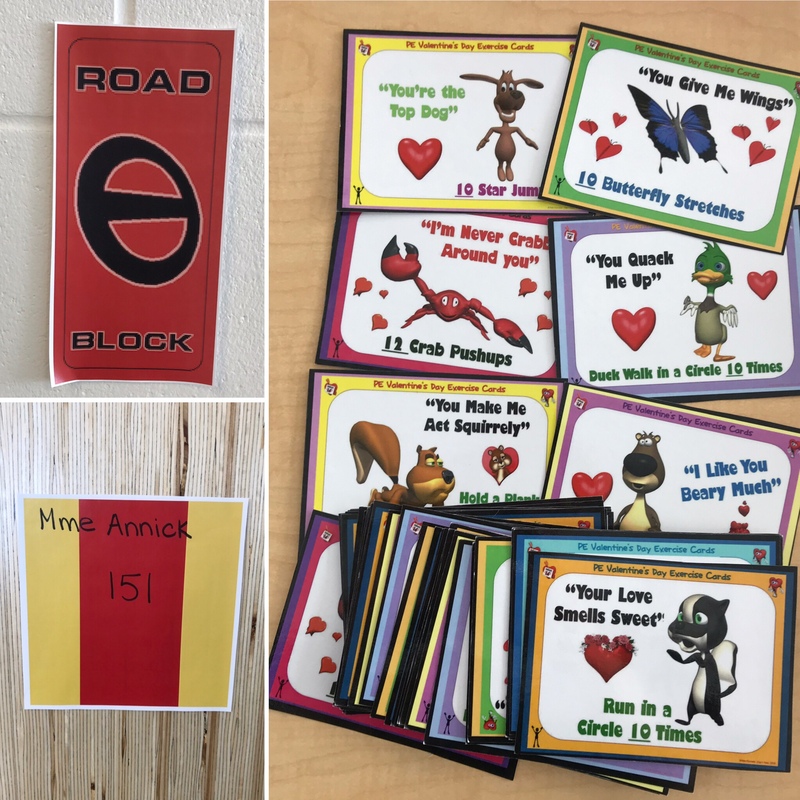 These road blocks were simply Valentine’s Day movement breaks that we sent groups off to do – we modified the valentines by telling students to do a total of 100 of that movement together with their groups. Once completed, they could come back and check if a spot had opened up for their next challenge. 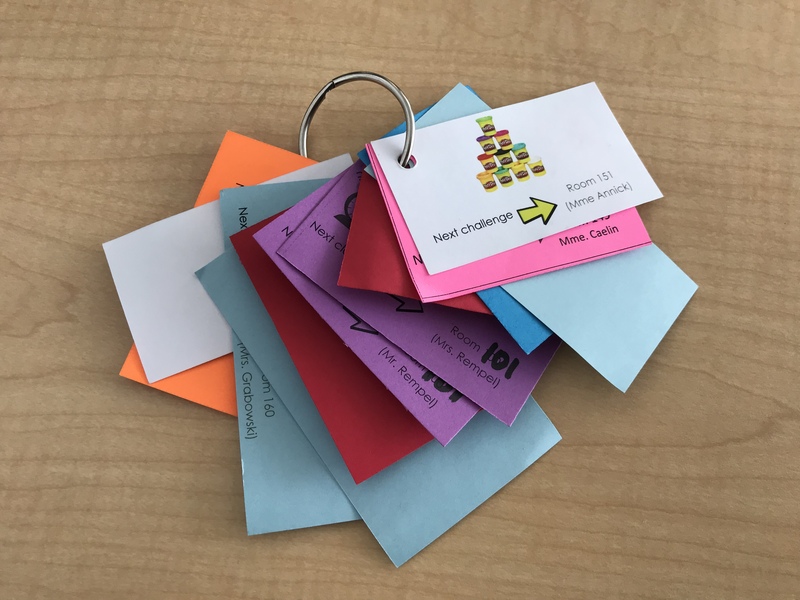 Once the challenges were completed, the students would receive their completion card to be put on their team ring and move onto the next challenge! 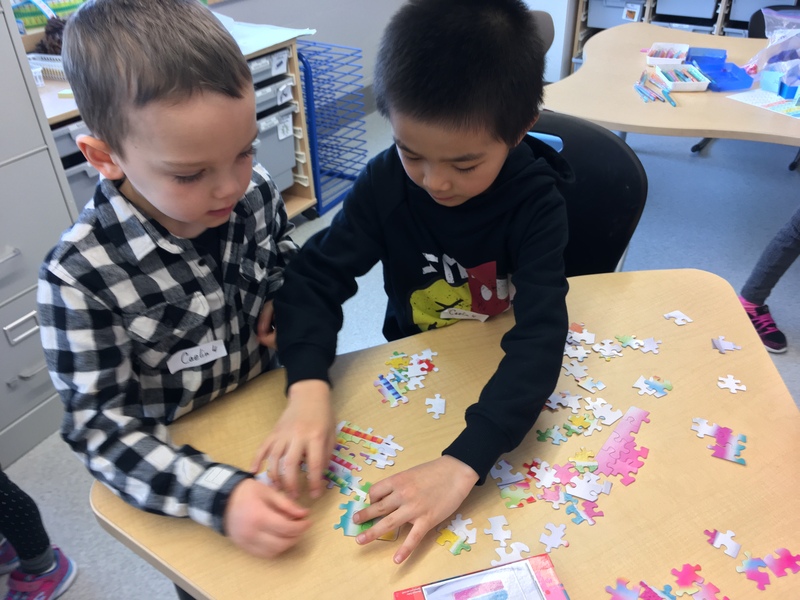 To get ready for the day, we contacted parents to ask for volunteers, we divided up our classes in groups of 4 or 5 students, and arranged for all of the groups to begin at different challenges through our big loop. The task: complete as many challenges as you possibly can with you group over the course of the morning! Ready? Set? GO! 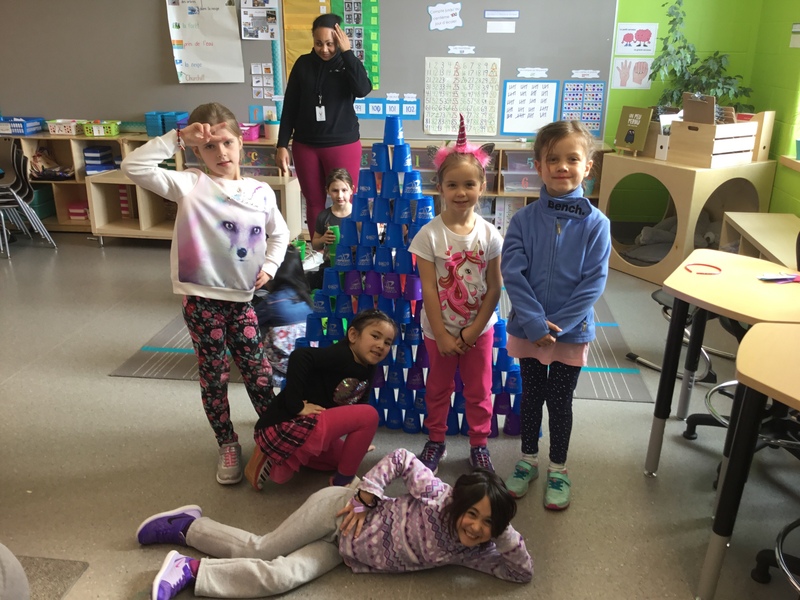 Challenge 2: Build a tower using 100 cups. It must be at least as tall as the shortest team member. Challenge 3: Represent 100 with play-doh. 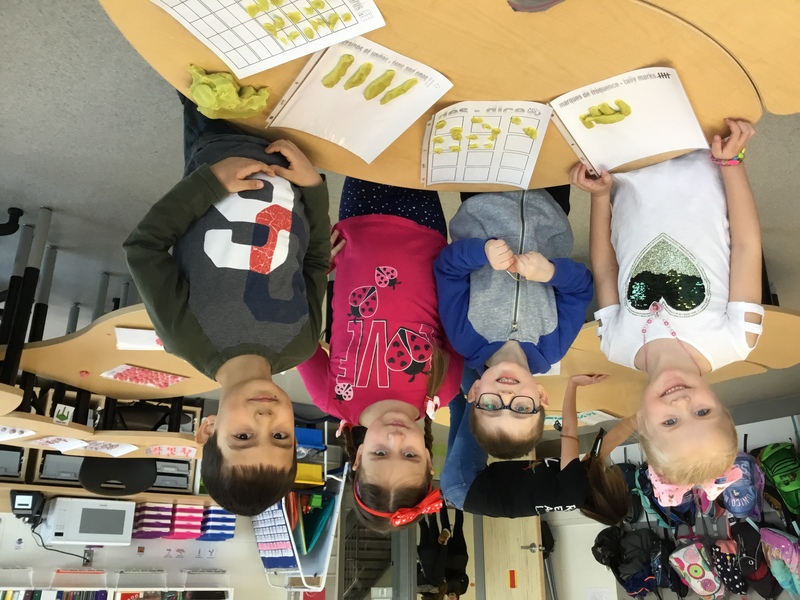 You must use ten frame cards, tally marks, tens and ones, and dice, and all of those together must equal 100. 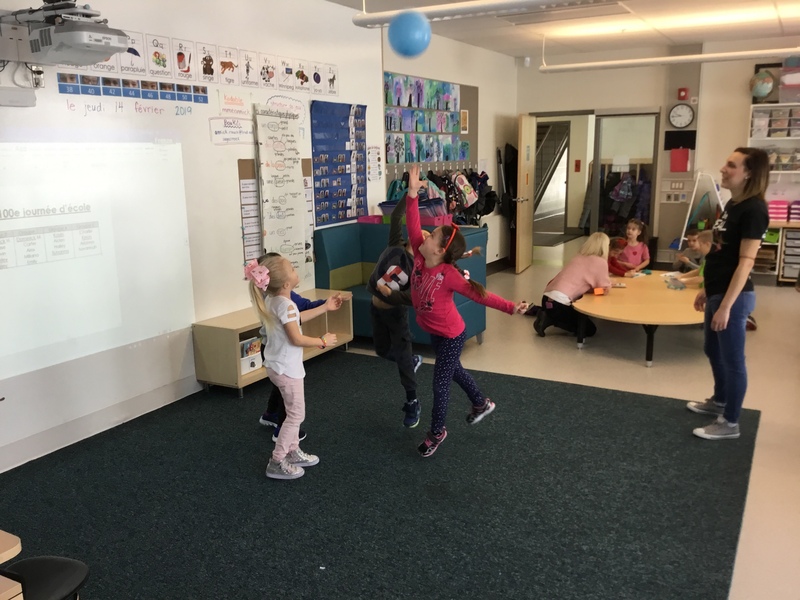 Challenge 4: Pass the balloon within your group 100 times in a row without dropping it. If you drop it, you have to start at 0 again. 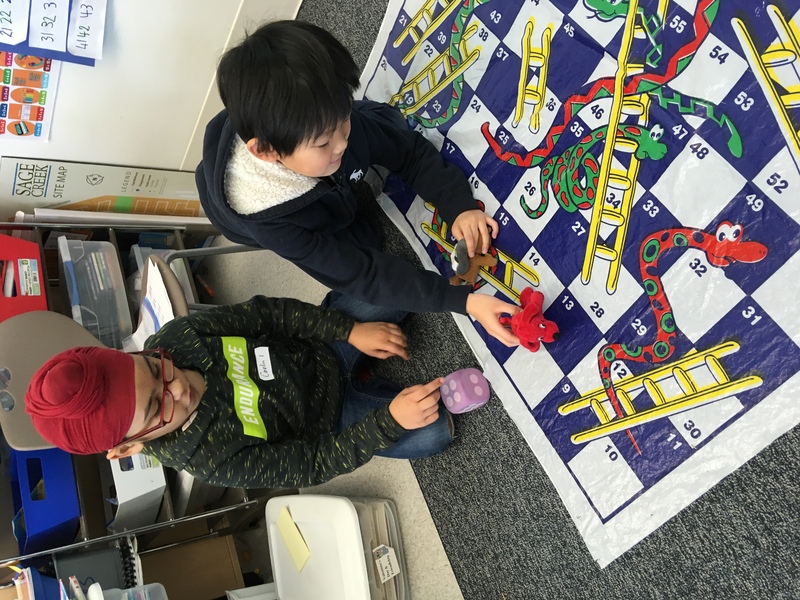 Challenge 5: Play snakes and ladders to 100. 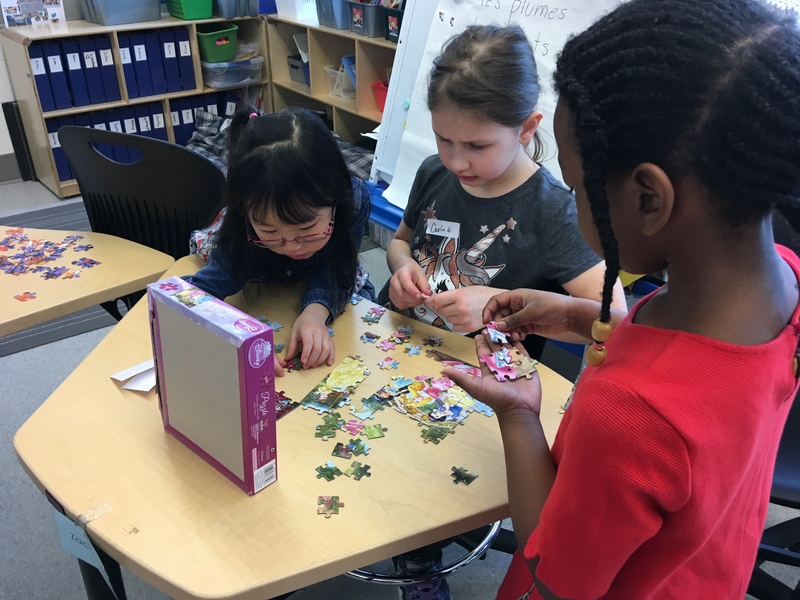 Challenge 6: Help complete 100 piece puzzles! How many full puzzles can we complete? 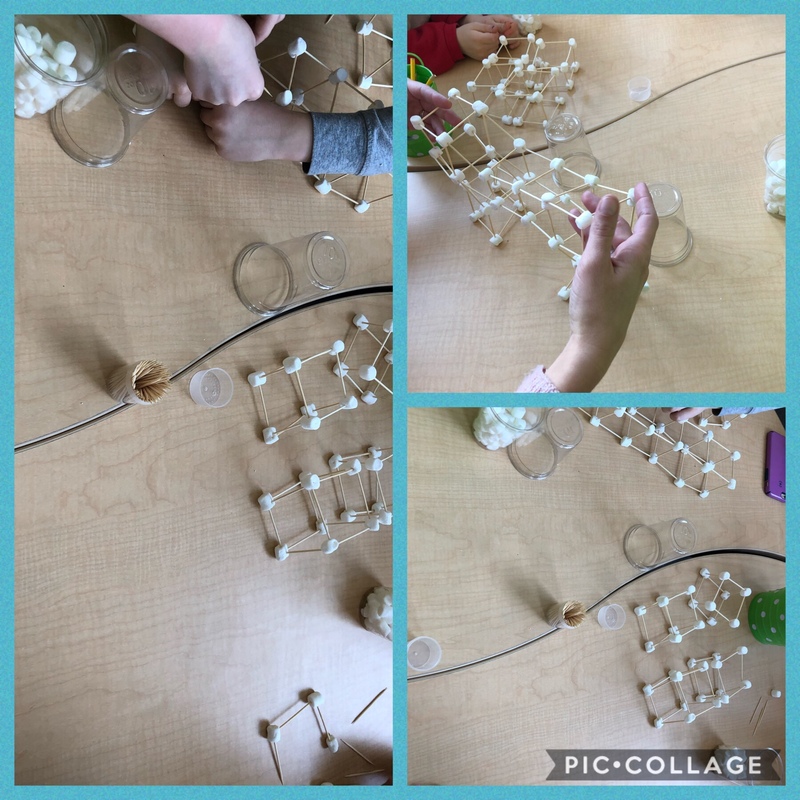 Challenge 8: Using 100 toothpicks and some marshmallows, build a bridge that holds 100 counters. 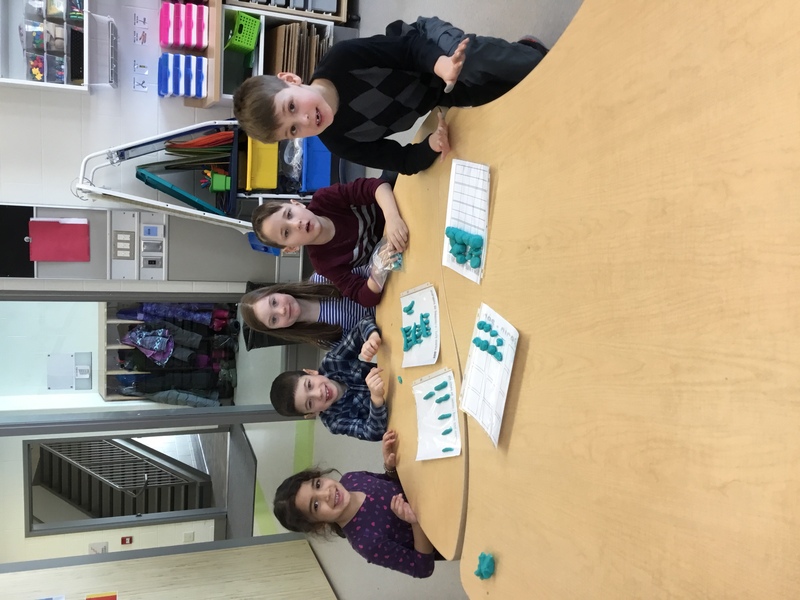 Challenge 9: Work together to put the numbers on the large 100 chart. Challenge 10: Work together to make something with 100 pieces of Lego and ask an adult to take a picture of it. Challenge 14: Treasure hunt through numbered gems to organize in order on a 100 map. I am blown away by how smoothly the morning went with all of these challenges and over 150 students just doing their thing while they moved through the school. 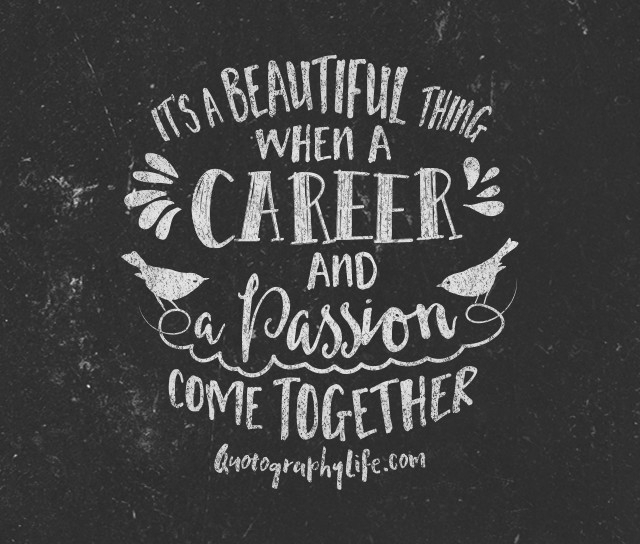 I am so thankful to work with such an incredible team who is always willing to collaborate, share ideas, and then work hard to make them come to life for our students! 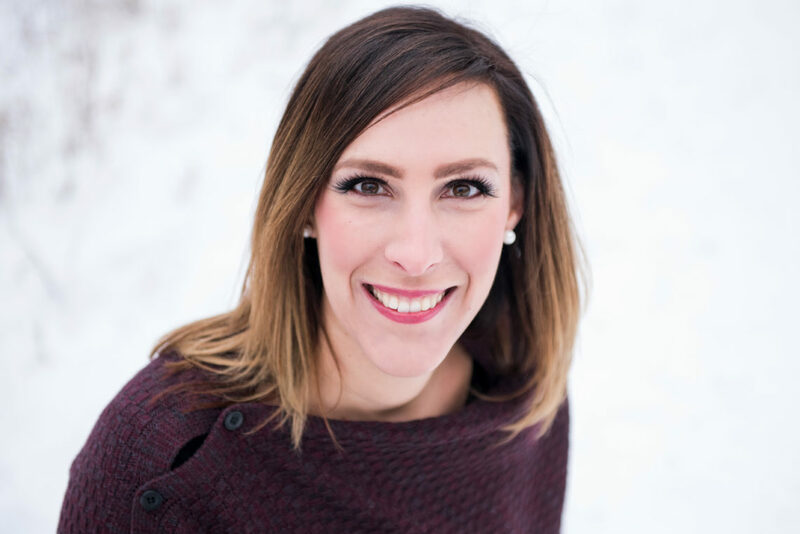 I am grateful to be a part of this amazing grade 1 and 1/2 team of teachers at École Sage Creek School; without you, this wouldn’t have been possible! 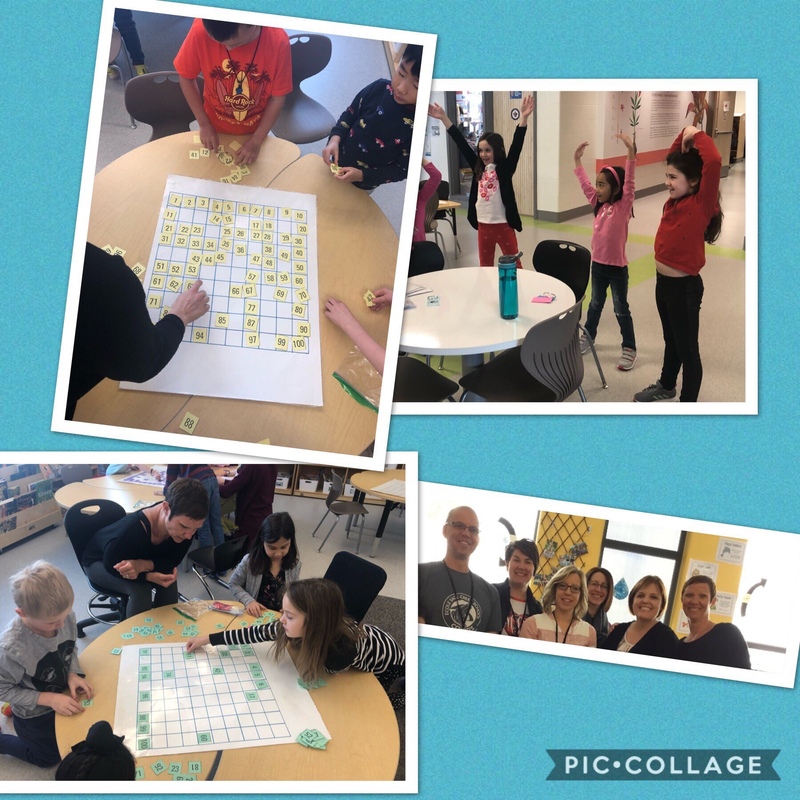 And a very special thank you to all of the parent volunteers who came to help us with the different challenges, the road blocks, and simply being present in the hallways to help students get to their next challenges! It really was a beautiful sight to see so many working together to make this day run so smoothly; a day that students will hopefully remember for a long time.